I live in Nebraska and gas is averaging about $3.85/gallon here. So, I'm paying almost 12% tax on every gallon. Incredible, isn't it folks? If the oil companies were making that much profit on every gallon, can you imagine how much more the fools in Congress would be demonizing them? 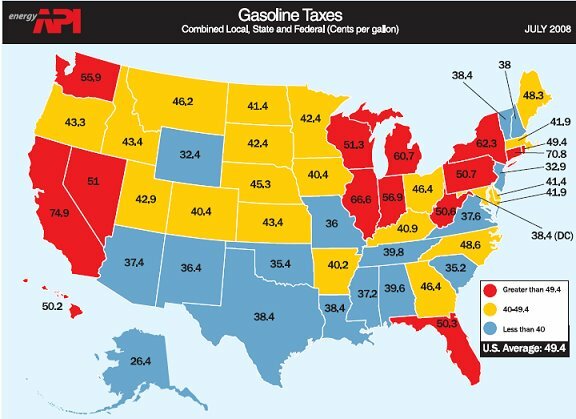 I'm in Illinois, which has one of the highest gas taxes in the country. Gas here is now around $4.30 a gallon. Cook County just raised the sales tax one point to above 10%, meaning we now have the highest urban sales tax in the nation. My cup of coffee from Dunkin' Donuts (a small cup) just set me back $1.65, up 10 cents from yesterday, before the new tax took effect. Linked. This is SUCH a good way to display the problem.